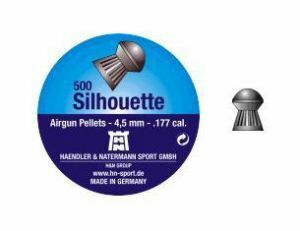 Home › AIR GUNS AMMUNITION › PELLETS H & N › Air gun pellets H & N Silhouette 5.5 mm. Air gun pellets H & N Silhouette 5.5 mm. Pellets for air gun H & N Silhouette 5.5 mm. Caliber 5,5 mm. Weight 1.06 g. Quantity 200 pieces in box. Moderate-weight pellets with notched body with embossed edge of the head. Suitable for shooting at long distances.